Mission Free Iran condemns the violent arrest and detention of the family of political prisoner Habibollah Latifi, calls for their release and the release of all political prisoners in Iran, and demands that governments take immediate steps to close the doors to the Islamic Republic’s Embassy in their respective countries. 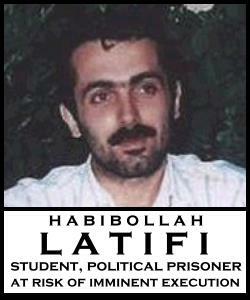 December 27, 2010, Washington, DC — According to news from several human rights organizations in Iran, numerous family members of beloved student and political prisoner Habibollah Latifi were detained in a violent attack by Islamic Republic security forces on the family home at about 10pm in the evening on December 26, 2010. The Islamic Republic had intended to execute Latifi on the morning of December 26; however, a global outcry in opposition to the news of the impending execution seemed to have at least temporarily halted the execution. But by later ransacking the family’s home, confiscating computers and documents, and arresting several family members, the regime clearly intends to silence their protest, very possibly as a prelude to killing Habibollah Latifi. Mission Free Iran condemns the criminal actions of the Islamic Republic and calls for the immediate and unconditional release of Habibollah Latifi, Latifi’s family members, and all political prisoners in Iran. We have demanded, and continue to demand, that governments once and for all stop issuing meaningless condemnations of the Islamic Republic’s atrocities. We demand that governments start acting in support of the human rights of Iranian people, and thereby in the support of the human rights of all people. The Islamic Republic is not a legitimate government and it never has been. Its survival is entirely dependent on the use of execution and other similarly grotesque tortures and abuses as tools to manage the society. It is past time for governments to withdraw their implicit support of this regime and suspend all diplomatic relationships. We demand – in the name of Habibollah Latifi, and in the name of thousands upon thousands of those killed and waiting to be killed by this regime – that governments take immediate steps to close the doors to the Islamic Republic’s Embassy in their respective countries.